Manufacturing industry as we all know has long been in existence; however it is lagging behind. Manufacturing industry has been booming since the Industrial Age – from product manufacturing, to job shop, to high technology manufacturing. Since early 1980’s, the sector is in a continuous state of transition. Tracking a foreseeable sustainable growth, innovation, structured process, and competitive processing techniques are now essentially coming into play – and it’s exponentially upscaling. Alongside with this approach, global manufacturing industry like Industrial and High Tech face challenges that haven’t been encountered before. The top challenges are accuracy and competitive speed. These challenges are the result of growing (1) supplier and distributor demand, (2) rapid product lifecycles, and (3) short time-to-market schedules. Because of this, manufacturers are in a constant pressure to formulate solutions to immediately address the problems. They need of a solution to have collaboration platforms and management workflows – on-demand and real-time applications. Moreover, some manufacturers are in need to accelerate their new product development and introduction (NPDI) to catch up to their time-to-market objectives. One popular solution is to develop an in-house on premise system for automation. Without knowing, manufacturers — from small to large — don’t know the repercussions in developing one. 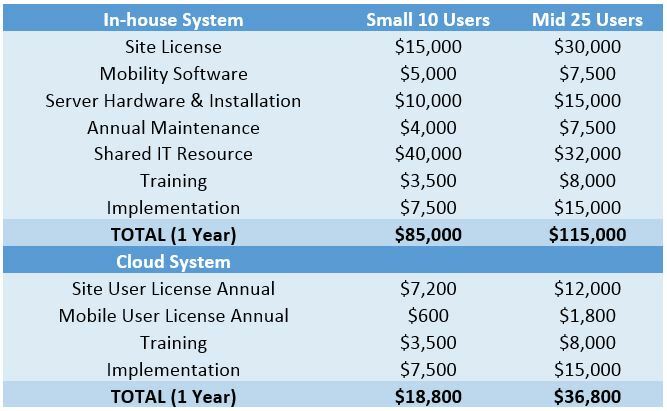 Here is a cost comparison from Computerized Maintenance Management Systems (CMMS) between the one developed in-house (excluding development costs) and deployed on cloud. The CEO of MintJutras said that based on a survey, 49% of people in the industry don’t have clear ideas on SaaS architectures. Meaning, almost half of the people in the industry don’t know the significance of the cloud structures and their impacts on businesses. 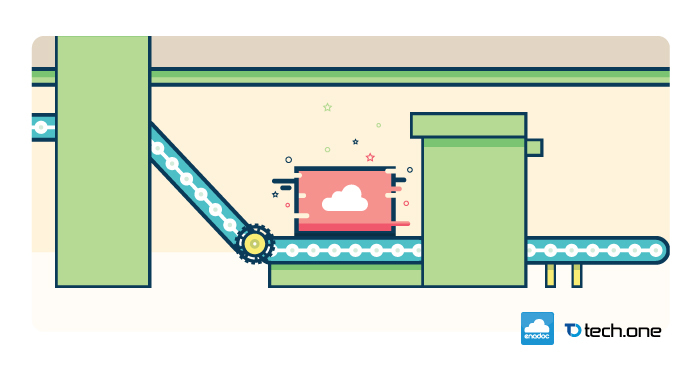 Despite the rapid adoption of cloud service in the IT industry in 2006, it hasn’t penetrated well in the manufacturing industry. In addition, recent researches state that of all software installed in manufacturing and distribution industry, 22% are only SaaS-based applications. The industry is still lagging behind in the application and the information regarding cloud services. Software as a Service (SaaS). The most visible in all category. It enables on demand use of software applications and solutions in user level. Infrastructure as a Service (IaaS). It provides storage for raw computing power and electronic storage data. Platform as a Service (PaaS). It provides tools to create companies’ own cloud services to operate and improved on. Business Processes as a Service (BPaaS). It provides single functionality or complete business process such as a customer relationship management (CRM) system. Currently, manufacturing industries are heavily investing mostly on solutions offered in the form of SaaS because (1) Cloud Services are offered in a fraction of the cost and (2) these offer variety of other advantages. Since businesses are now focused on accuracy while reducing cost, they are now opting to cloud solutions especially SaaS. Early adopters (businesses that easily adopts new technology) will have tremendous advantages of the cloud. Rapid Implementation. Regular implementation and integration from months down to weeks, compared to a local IT deployment. Frequent Innovation. As part of the on-going subscription, solution provider focuses on how to better the service with new features and functions. Cost Savings. From Capital Expenses to downsized Operating Expenses. It eliminates big capital burden and hardware and maintenance costs. Scalability. Easily add or subtract features and licenses depending on the need. Productivity Gains. Eliminate, automate multiple data entries to a single repository. Quality and Compliance. Ease of use is enhanced – Cloud allows easy and secure integration to partners and regulators. One of the major concerns is how secure their data is in the cloud. Most SaaS manufacturing and business applications are hosted in datacenters that are ISO27001 and/or SAS 70 Type II certified. These datacenters invest resources for backup, recovery, and security. These cloud services serve as a safety net to ensure the manufacturing business continues even if the internal servers fail or the company underwent a major data loss disaster. One example of an exemplary datacenter in the market is Microsoft Azure. Since datacenters are committed for backup, Microsoft Azure ensures that data are redundant – data are stored in multiple location if one datacenter fails. 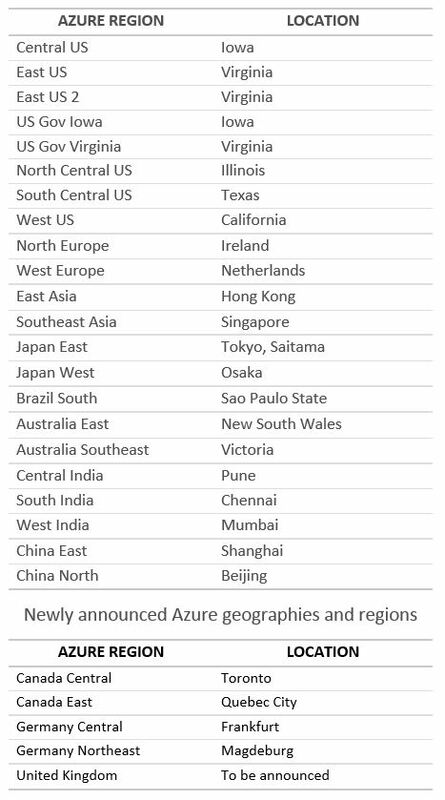 To visualize, Microsoft Azure has 19 regions around the world plus 5 additional ones. Geographic expansion is a priority for Microsoft Azure because it enables achieving higher performance and it supports requirements and preferences regarding data location. Microsoft Azure Infrastructure allows Locally Redundant Storage (LRS), which stores data locally within the users’ primary region. With Geo Redundant Storage (GRS), data is stored in a secondary region 250+ miles from the primary region but within the same geography. Stepping into the cloud provides accuracy and speed by almost four times in terms of manufacturing services. This revolutionizes how manufacturing businesses deliver their products and services to resellers and distributors. With a competent low-costs, ease of use, and reliable collaboration system, it is almost mandatory to have a cloud system in every businesses. In line with this, it closes the gap between high level and small–to–medium manufacturing services. Sooner or later, local IT infrastructure applications will be outdated – these would not keep up to the ever-increasing pace of commercial world, let alone consumer demands.